You may have heard rumblings around the internet already about this new book hitting the shelves! I am so thrilled to be part of H.S.J. 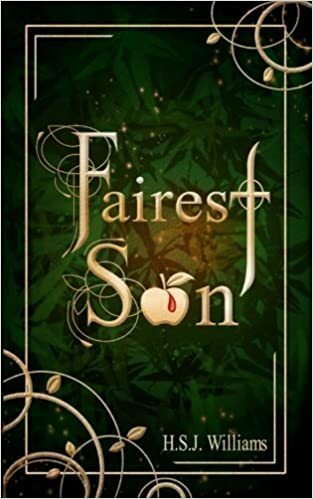 Williams’ blog tour this week, celebrating her debut novel, FAIREST SON! I’ve been super excited about this one since I first heard about it, and I am thrilled that it is now available to purchase. Today, I have the great privilege of introducing you to one of the characters in this story, but first, a little bit about the book itself! While the whitethorn tress were in blossom, Idris was born to the King and Queen of the Seelie Court. At his birth, a prophecy was spoken that he would one day reunite his kingdom with their sundered brethren, the Unseelie, for he was the fairest of all the folk. An enchantment was cast over him at a young age so that he could not die unless three certain things had befallen him, and these deadly keys were kept in secrecy. This did not deter his enemies, who scorned the prophecy, and in a tragic event, the young prince was left maimed and scarred with no hope of fulfilling his destiny. Broken, the prince went into hiding up in the high mountains, with only beasts and goblins for company. But while living there, he would refine skills and wisdom, ever growing in kindness and cunning. Appearance: While once possessing great beauty with summer gold hair and gleaming green eyes, Idris now keeps his temperance completely covered by white wrappings. Skills: Idris rediscovered his sight through carving figurines from the finest crystals and gems. He has a remarkable affinity to connect with animals, and indeed, with most people. This is most likely due to his gentleness rather than any magic. “I know what it is like to fear the deceptions of the Unseelie Court. I really like the name Idris! Thank you for the lovely post, Jenelle! You are welcome! Can’t wait to read it!